While most feel the economy has remained stable, the outlook within the home area is not as positive as it is among rural Minnesotans as a whole. More than half (56%) of home area residents reported their economy has stayed the same compared to a year ago. Only 22 percent feel it has improved since last year. Compared to 36 percent of the rural population, 54 percent of home area residents feel their community does not provide an adequate number of jobs that pay household supporting wages. Four in 10 (41%) do not feel their community successfully maintains or grows job opportunities, and 45 percent feel as though their community does not support economic development. Only 17 percent of home area residents saw a decline in their annual household income within the past year – down from 24 percent in 2016. Nearly one-third (29%) saw an increase. Most home area residents feel they can personally impact their community but remain less optimistic about their future than other rural residents. Sixty-nine percent of home area residents are optimistic about the future of their community, compared to 78 percent of rural residents. Eight in 10 (81%) are confident in their ability to personally make a positive impact within their community. Home area residents are largely confident in their community’s ability to work together effectively. Eighty-two percent of home area residents believe their community works together effectively when addressing local issues. This is equivalent to the total percentage of rural Minnesotans that agree with this statement. While overall responses skew positive, there are key areas in which home area residents feel quality of life could be improved. Just over half (55%) feel their community is doing a good job in providing adequate daycare options. Eight in 10 (83%) residents are satisfied with crime control within their community. While three-quarters (75%) feel adequate healthcare is provided in their community, only six in 10 (62%) believe their community is doing a good job of handling the opioid and drug abuse crisis. Additionally, three out of 10 do not feel as though their community is doing well at addressing mental health issues of residents. Sixty-three percent of those that live in the home area believe their community is providing adequate affordable housing for residents, compared to 68 percent of all rural residents. A lack of job opportunities within the home area is the number one reason residents would consider moving. Only five percent of home area residents do not expect to be living in the same community five years from now. However, a somewhat higher percentage (19%) have considered moving to a metro area in the past two years than the overall rural population (14 percent). Nearly two-thirds (66%) of those who have considered a move to a metro area identified job opportunities as the reason. This is nearly double the percentage (35%) of total rural residents. 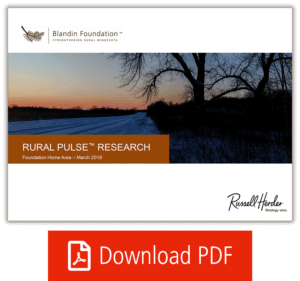 Residents of the home area are more likely than other rural Minnesotans to feel the needs of rural communities are less important to legislators and policymakers than those of the metro area. Nearly half (44%) disagree that their voice is being equally considered, compared to 38 percent of overall rural residents. Diversity and inclusion gaps continue. Fifty-eight percent of home area residents reported having few if any friends of a different race or culture. This is above the overall rural resident percentage of 52 percent. Similar to other rural residents, the home area felt transgender people and those with drug or mental health issues were the most discriminated against. Eight in 10 (82%) believe members of their community are able to stand up to hate and discrimination when they see it occur. Community members are open to accepting a leadership role if asked, but cite time limitations as an obstacle. Slightly more than half (54%) of home area residents feel as though leadership roles within their community are held by people from diverse backgrounds. However, this is lower than the previous three studies. Forty-four percent have not served in a leadership role within their community. They are slightly more likely to consider doing so than other rural Minnesotans. Of those who have not served in a leadership role, more than five in 10 (54%) stated it is due to a lack of time. Download the Foundation Home Area special report PDF for full details.